Home > Ask Our Experts > Why do we not hear about Winberries? Q.When are winberries in season and why do we not hear alot about them anymore? The first part of your question is a lot easier to answer than the second – if you’re looking to harvest some wild winberries, then I’m afraid you’ve almost certainly missed your chance. In most years, they can be collected from July to September, though depending on the weather and whereabouts you are in the country that can stretch a bit in either direction. As to why we don’t hear much about them anymore – the answer is probably because they also have a number of other names, which seem to have become more commonly used. Winberries – sometimes written as whinberries, whimberries or whynberries – are also known as blaeberries, bilberries, whortleberries or huckleberries (as in Mark Twain’s Huckleberry Finn). Originally largely regional names, people obviously kept the name for these delicious berries that they were used to when they moved, so there is now considerable confusion as a result, with a lot of people firmly convinced that they are all different fruits! Throw in the influence of other countries “folk” names for winberries – especially Finland and Scandinavia where they have been historically used – and things get even more complicated, with the likes of “blåbær” being normally translated as “blueberry”. 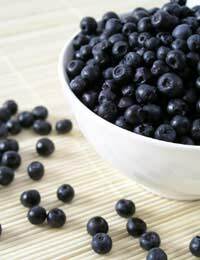 Along with the likes of cranberries, blueberries and lingonberries, winberries belong to the botanical genus Vaccinium, which is part of the Heath or Ericaceous family of plants (Ericaceae). The group contains around 450 species, most of which live in the cooler and more westerly parts of the northern hemisphere – though a few are found south of the equator. Just to complete the picture of horticultural confusion, many of these species can hybridise – and then goodness only knows what you’d call them! Until fairly recently, there were plenty of recipes for winberries, particularly amongst country-folk, but with the growth of supermarkets and imported “proper” fruit, like many of the old staples, the blaeberry seems to have fallen out of favour – at least until now. In one of those ironic twists, as society has become more concerned about organic and environmental issues – things like food miles and how our food is produced has started to bring many of the old favourites back in fashion. While we may not all start cooking the rabbit, grouse, venison or pigeon for which winberries once formed the traditional accompaniment, these wild berries may yet become more popular once again and then you’ll hear more about them – whatever you call them yourself! @cantona - thanks for this info. I'll look out for them. Bury is not too far away. Wimberry Pies are always for sale at Bury market on one or two cake stalls. They are a local favourite, so go early to ensure to get yours. Where exactly in Chorley can I find them please? Just had wimberry pie with cream after tea. We can get them on holcombe hill in Bury. Been having them since childhood and love them even though the season is short. We call them wimberries in Lancashire.Wimberry pies were very common in cake shops when I was young and you could also buy them in punnets at the greengrocers.They seem to have disappeared now. What a shame as they have a far superior taste to say, blackcurrants. Wonder if anyone sells them as I would love to make a wimberry pie. Would even plant a bush if I could find one at the garden centre but that's doesn't seem likely. We live in the trough of Bowland, Lancashire and are very lucky to know of a few places to pick winberries. We find that they like to grow on hills across the moors but are only ever on one side of the hill. They seem to grow near Heather too and haven't really seen them growing anywhere near brambles. The midges love to hide under them though and the winberries like to hide under their plants leaves which can make them quite difficult to pick. Very much worth it though, they are a very tasty fruit. Also expensive so if you get a good crop sometime, you may be able to sell some to your local bakery or deli :-) Happy picking (if you still have time left this year)! Many thanks for sharing your information with us. We hope you manage to find some this year. We live in the trough of Bowland, Lancashire and are very lucky to know of a few places to pick winberries... We find that they like to grow on hills across the moors but are only ever on one side of the hill. They seem to grow near Heather too and haven't really seen them growing anywhere near brambles. The midges love to hide under them though and the winberries like to hide under their plants leaves which can make them quite difficult to pick. Very much worth it though, they are a very tasty fruit. Also expensive so if you get a good crop sometime, you may be able to sell some to your local bakery or deli :-) Happy picking (if you still have time left this year)! We have recently moved to north Derbyshire where these fruit are referred to as "wimberries", with an "m". So popular are they that a local hill is known as Wimberry Hill, though I've never seen a wimberry on it! The local butcher (of all people) makes a delicious wimberry fruit pie and has recently started adding them to lamb burgers, which are stunning. Many thanks for your comments - at least our readers know where they may be able to find and taste them in pies! Having lived in Lancashire for 47 years, being taught about these delicious berries by my wonderful Grandma and enjoying them almost every year, I now live on the Isle of Man; whilst a passenger in the car I thought I recognised the familiar, low lying bushes on the moorland and asked my partner to stop the car. I squealed with delight when I could see they were indeed whinberry bushes, keeping a close eye on them as they should ripen pretty soon; Whinberry Ripple Ice Cream as well as the usual recipes if it is a good harvest. Keep on foraging! We saw them for sale in Abergavenny street market yesterday. That's why I am on this site to find out what they are. I have literally read all responses to the winberry question rather a long delay sadly. where would be the nearest market to Cardiff area where I could purchase these purple balls of deliciousnessperhaps it is too late?. I am 83 and live in the Rhymney valley .my daughter and granddaughter recently picked winberrys and made the yearly batch of pies .I must say i love the taste and haven't missed a year since i can remember. My granddaughter took her children picking this wonderful fruit so the tradition can be passed on. Its a pity its not more available so everyone can taste it. Can you transplant winberry bushes or take cuttings? I adore this fruit and it reminds me of my childhood, learning to cook from my Grandma and Great Aunt ?? Winberries, are quite difficult to grow and generally found in acidic, nutrient-poor soils and can be found across moorland. If you don't live in an area with acidic soil, bilberry bushes can be grown in containers. However, you will need a few in order to get a decent crop and for cross-pollination. I was born some years ago in the Rhymney valley south wales it was as a child I would pick winberries with my mother on a very steep mountain side near our home .I will never forget the joy of the smell of my Mums winberry tart then the silence whilst we ate it BLISS!! I have not lived at home since I was 18 but still dream of finding a retailer of this wonderful fruit and relive and share with my grandchildrenthe sublime winberrytart can anyone help? This superb article answered all our questions and many more we had not thought of. And the comments afterwards almost brought tears to our eyes. Thanks everyone. Keep on wyning! Where I live (Mossley/greenfield/saddleworth), they're all over the place. They like to be on steep north facing slopes at around 250 to 300 meters. Local shops sell amazing winberry pies (best is small shop in Heyrod). Makes good jam, pies, crumbles. Good with chicken, turkey, venison. Nice mixed with local blackberries or redcurrants. Best place I know is the road between Mossley and Groton.